Trey Gowdy, the chairman of the House Select Committee on Benghazi, wrote to the State Department in July alleging that certain Benghazi-related documents provided to the committee are "unnecessarily" and "improperly" marked as classified. Gowdy's letter, obtained by National Journal, was sent just weeks before the controversy over Hillary Clinton's emails intensified with fresh questions about the extent and sensitivity of classified information in her private email system. Gowdy, along with many other Republicans, has said the presence of classified information in the private email system Clinton used as secretary of State may have jeopardized national security. But some experts believe that overclassification by the intelligence community—that is, needless classification of documents that would not harm security if made public—may be occurring with messages in Clinton's system. Gowdy also believes some documents are unnecessarily labeled as classified. 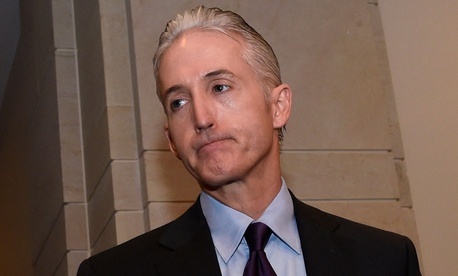 In this case, Gowdy was concerned with documents connected with the outside panel largely selected by the State Department that reviewed the 2012 Benghazi attack. "There appear to be substantial issues with respect to the April production of documents related to the Benghazi Accountability Review Board," Gowdy wrote to Secretary of State John Kerry on July 8. Rep. Elijah Cummings, the top Democrat on the House Benghazi panel, cited Gowdy's comments on classification in accusing Republicans of election-year political motives in their focus on classified information that crossed Clinton's server. "Republican complaints that the State Department overclassified documents provided to the Select Committee only further show how complicated and complex these classification issues are, how individuals regularly disagree about whether information should be classified, and how overclassification is a systemic problem throughout the government and has been for years," Cummings said in a statement. "In light of their previous complaints about the State Department's systemic overclassification, Committee Republicans' newfound concerns about the underclassification of those emails that were forwarded to Secretary Clinton seem to be more based on election politics than anything else," Cummings said. In March, Clinton said there was no classified information in her private email system. But the frontrunner for the Democratic White House nomination has since softened her stance to say there was no information in her messages that was marked classified when it was sent or received. A spokeswoman for Gowdy, asked about whether overclassification could also be occurring with respect to Clinton's emails, cited the Justice Department's probe of the security of Clinton's email arrangement, which was spurred by concerns about the security of classified information. "We are not going to hypothesize about the ongoing investigation, and we trust the FBI will evaluate these issues under the same strict standards that would apply to anyone. While the Select Committee may have uncovered Secretary Clinton's exclusive use of private email for official business, she and she alone created the problems stemming from her unusual arrangement with herself," said spokeswoman Amanda Duvall. Gowdy's July 8 letter says many of the documents related to the Accountability Review Board's probe given to the committee in April are improperly classified in several ways. In one case, he writes that information in almost all interview summaries does not fall within national security categories that allow for classification. In addition, he notes that the documents related to the inquiry the do not bear the name of the person with classification power who reviewed the information, or the reason for the classification decision. Gowdy's letter, citing President Obama's 2009 executive order that's aimed in part at lessening overclassification, asks for a State Department review of the classification status of the documents in question. The State Department has not yet responded to Gowdy's letter. Classification of material makes it more difficult for committees to cite the documents in reports or discuss them in hearings.